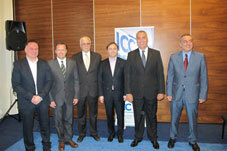 On May 28, the International Chamber of Commerce in Georgia held a general assembly and elected the board of directors. The assembly was opened by the chairman of the organization Fady Asly, who gave the highlights of the activities recently conducted by the organization. The purpose of this last meeting was to elect a new board of directors. There were 11 candidates for 7 positions. The candidates briefly made their cases for being elected. The new elected board is composed of: Fady Asly, Lekso Aleksishvili, Zaza Bibilashvili, Irakli Bokuchava, Stephen Jonson, Nikoloz Khundzakishvili, and Nikoloz Mchedlishvili. The Position of the Chairman has been retained by the incumbent, Fady Asli. Lekso Aleksishvili was appointed as the first Vice Chairman, while Nikoloz Khundzakishvili was elected as the Second Vice Chairman of the ICC.